Before rewiring any ceiling fan, turn off electrical current at source by turning off circuit breakers. WARNING: Failing to disconnect power supply to ceiling fan may result in severe injury or death. Unscrew the switch nut attached to the current fan switch. Remove wires from existing fan switch. If wires are hard to remove, insert a paper clip into each hole (numbered 1, 2, 3, 4, L) and pull the wire out. 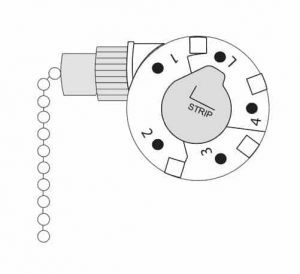 Find the word “STRIP” on the back of the fan switch. The lead Length on each wire to be re-attached to the new fan switch should be the same length as the line above word “STRIP”.